20160524 - UP in the am and in to work. We had the Board of Directors, Sales Team and a customer on site today, so very busy. I ducked out a couple min early to pick up some things we won on an online auction and set up an account with them. 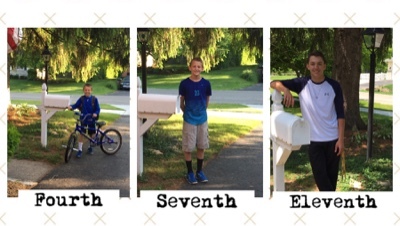 L reported all 3 boys passed school and are now done for the year. Grant got some awards, 'Most Giving' and something else. Hard to tell which were official awards as he found blank ones on the recycle bin at school, took them and filled them out for himself ;-) D had baseball practice tonight. I headed up to Mansfield to go to Adam Shambre's wife's calling hours. Very sad story, cancer took her very fast. Great to see Adam. on the way out I found Adam's boys and told them a story of when we were young and while Adam and I were on a double date at a movie theater he went into the women's bathroom by mistake and was too embarrassed to come out... Across the road for a nice dinner with Gma&paW and then down the road home. Stayed up late getting things set up on the PC for more auction purchases.